A note from Jeffrey Keith: “Inspired by the wonderful contributions of my erstwhile formmates, and, it must be said, the stirring pictures of the women of ’73, I write my own notes regarding life with the Keith family in Denver, Colo. This city is exploding, please don’t come. I moved here over 30 years ago for the real estate, meaning for the vast number of empty warehouses, perfect for cheap live-in studio space, to make big, messy, smelly oil paintings. Now all that has gone by the wayside for millennial housing, yoga and fitness clubs, chic boutiques, wall-to-wall start-ups with the word “creative” in their names, microbreweries, cyber-cafes, dispensaries, restaurants, comedy clubs, and bars. I feel like a genius for moving here back then because now, finally, this city has become a great place to come of age for my two amazing sons, Charlie and Owen. Charlie, 13, plays a mean defender with Colorado Rapids Youth Soccer, and excels at math (anybody remember the History of Math class specially created for a few choice seniors so we could bypass calculus and graduate?). Owen, 16, is shining brightly in the visual arts program at Denver School of the Arts and excels in all things tech, social/digital media, A.I., classical piano, and, also, somehow, calculus. I don’t know how I would survive the 21st century without a 16 year-old tech advisor in the house. My sainted wife, Sara, is a full-on Tibetan bodhisattva and is at Iliff School of Theology, studying for her second degree to become a Buddhist chaplain. (Yes, it is a thing. I, on the other hand, am the zazen member of the family). From Alan Frey: “Working at Maine Wood Works in Saco, Maine, doing the prep-sanding duties on the (cottage-style) furniture on its way to top coat painting, so I sand and smooth down the beds, bureaus, and chests/tables after they’ve been primed. Our motto is “smooth as an android’s bottom, eh, Data?” Why do I dig this work so much? Not really sure. It’s repetitive. Maybe it’s a daily “Groundhog Day” experience. I have gotten better at this. Tried a bunch of things: 10 years in commercial casualty insurance, like my dad. It was ok, and I was even earning some dollars for a while at the end. But moved to Maine in 1987, tried education for about eight years, and it never quite clicked. Tried sales, good for 11 months then the close rate plateaued, and I went into customer service. That was a winner, but I wanted to do it at a better outfit, and couldn’t quite find a good way into the best couple of companies around Portland, Maine. I wound up working the census in my neighborhood in Portland and also tried my hand as a landlord. I was not put on the planet – clearly – to chase rent checks, fund endless building repairs, pay city water and sewage bills, etc. Sold that building by the skin of my teeth. A constant for me has been the music. I have been producing a radio show for more than 20 years now at WMPG, USM’s community radio station. The focus is blues, R&B, and gospel, and I’m on every other Saturday from 5 to 7 p.m. The website is wmpg.org. 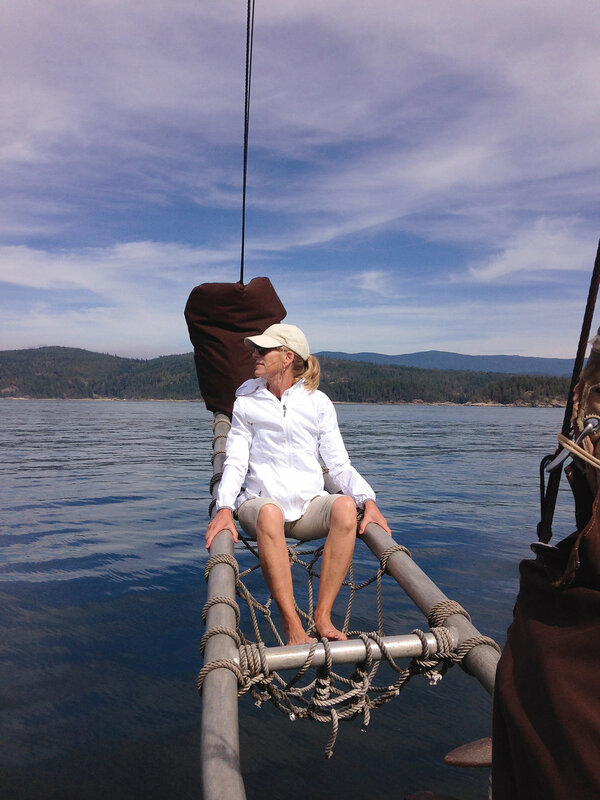 Jeff Keith ’72 continues to create art from his home in Denver, Colo.
Julia Alexander ’72 in Cortes Island, B.C. Lin Giralt ’72 (blue shirt and hat) with his summer school class at Shanghai’s Jiao Tong University. Lucinda and Paul Dean saw their daughter, Laura Closson Dean ’04, granddaughter of Burton Closson Jr. ’48, marry Carmine Grimaldi ’04 in Biddeford Pool, Maine on September 15, 2018. Georgia Channing ’17 (l.), Santiago Saravia ’17 (r.), and Sheldon Whitehouse ’74 at a Saunderstown, R.I., fundraiser for Sheldon’s U.S. Senate re-election. 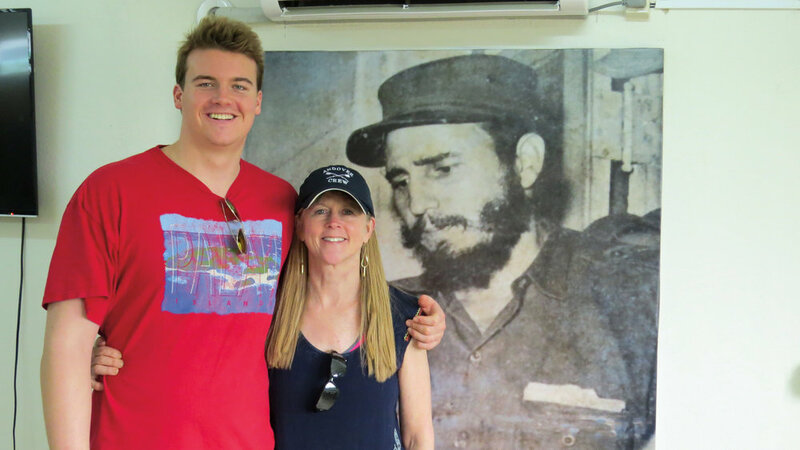 Helen Bouscaren ’75 with son Travis, communing with Fidel in Cuba this summer. Kim Henning was very excited to have taken her daughter, Julia, to begin her freshman year at Scripps College. A huge bonus was running into Nina Bohlen, who was dropping off her niece at Scripps – also a freshman. From Talie Ward Harris: “What a difference a year makes. Having missed last year’s 40th due to lymphoma, I’m happy to report that my hair is back and so are a bunch of pals from Millville. And my appetite. No one wants to visit Maine in January, but they’re all here in August. Warren Ingersoll and I boated across Casco Bay to see Betsy and Matthew St. Onge and Bill Reynolds and his Betsy on Little Diamond. I left them there – last seen stuffing pockets with blueberries. A week later, Chris Willis motored us around Somes Sound on the S.S. Midnight Rider and we later joined Perot Bissell, his daughter Helen ’14, and Chris’s daughter, Caroline ’14, at XYZ in Southwest Harbor for a rip-roaring Mexican dinner. Twelve hours later, I watched Nick Newlin whipping up scrambled eggs at the home of his father, Bill Newlin ’51, in Northeast Harbor. It could have been Upper on a Sunday morning oh so many years ago. A few days after returning home from Southwest Harbor, Warren Cramer stopped by on his way up to Northeast Harbor. Dizzy yet? Wait, there’s more. Cici Cruice Peterson joined DeeDee Look and me for dinner after her brief stay in Maine. Cici is finishing up her master’s in social work and will soon start her new career as a social worker in Denver. Grandson Walter Ward Harris joined us for a week of shenanigans. His favorite book? The Truck Book, sent by Annie O’Herron Burleigh – whose daughter, Emmy, will wed on September 29, 2018, in the same church where Annie and Jon were married 33 years ago. A note from Bill Reynolds: “On Saturday, September 8, a small contingent of SPS alumni, including Chris Willis, John Sweet ’78, Mitchell Kelly ’78, Allen Hance, Tom Luz ’78, and I, attended a memorial service for Sandy Kaynor at the Yale Club in New York City. Despite the tragic circumstances of Sandy’s death, the service, organized by Sandy’s fellow Elis, was far from a solemn affair, but rather a celebration of Sandy’s spirit and love of life and music. The afternoon was filled with stories and featured performances by former members of the Alley Cats and Wiffenpoofs, Yale’s renowned a cappella singing groups, of which Sandy was a member during his time at Yale. Sandy’s son, Granville, a sophomore at Trinity College, also performed with members of the Accidentals. Granville clearly inherited Sandy’s love of music. His stirring solo rendition of “Hallelujah” brought down the house. 1977 Formmates (l. to r.) Bill Reynolds, Talie Ward Harris, Matthew St Onge, and Warren Ingersoll on Little Diamond Island in Maine. (L. to r.) Jon Sweet ’78, Bill Reynolds ’77, Mitchell Kelly ’78, Allen Hance ’77, Chris Willis ’77, and Tom Luz ’78 at the memorial celebration for Sandy Kaynor ’77. On September 8, Edie Farwell and Nora Tracy Phillips met in Hopkinton, N.H., to share in the moving “memorial service of celebration and thanksgiving for the life of” former longtime SPS math teacher (and their two-year Drury housemaster and friend) George Chase, Sr. As Edie noted, “the service was filled with many stories of all the people he inspired, his quintessential goodness, attentiveness to youth, teaching skills, and the many ways in which he was a truly wonderful person.” They expected to – and happily did – see Mr. Chase’s son, Sam, and his family at the service. What they had not anticipated was the remarkable number of former (and more current – yes, Matt Soule ’77, we saw you) SPS faculty members who attended the service as well. Though the service marked a sad passing, it did so by reminding all who were there of the powerful ties that bind us to so many wonderful people of all generations through our St. Paul’s School associations. Form of 1978 formmates (l. to r.) Edie Farwell, Sam Chase, and Nora Tracy Phillips at the September memorial service for George Chase. Two generations of Paulies enjoying a summer evening together in East Hampton, N.Y. (l. to r.): Julia Schloss ’15, Richard Schloss ’78, Electra McDowell Lang ’78, Nancy Weltchek ’78, Lisa Henriques Hughes ’78, and Livia Hughes ’19. Bill Martin ’79 (l.) hosted Dave Stevenson ’79 during a recent trip to Berlin, Germany.